Premium doughnut retailer Krispy Kreme UK has announced a development in its customer strategy, now encompassing a feedback programme which measures the experience of real customers at its UK retail outlets. We wanted to move towards a customer feedback programme focussed on the actual customer’s views and needs. The company has launched a customer experience management (CEM) programme with industry experts Empathica across its 50-strong UK store estate. “We wanted to move towards a customer feedback programme focussed on the actual customer’s views and needs” said Judith Denby, Chief Marketing Officer for Krispy Kreme. Guests are prompted to complete an online feedback survey via bespoke invitations actively handed out by store staff featuring prominent QR codes that push users directly to an online survey page. Respondents are asked a tailored set of questions specific to their experience, with the insights being fed back directly to relevant Krispy Kreme teams, from individual stores to the brand level. The Empathica system is programmed to recognise customers that have had a positive experience, and simultaneously delivers employee specific feedback alert to the location manager, as well as prompting the customer to share that experience with their social media networks via Empathica’s patent-pending advocacy engine GoRecommendTM. Empathica is the leading provider of social Customer Experience Management (CEM) programmes to the world’s most respected multi-unit brands in the retail, hospitality, banking and petro sectors. Its rich analysis of survey data using state-of-the-art surveying and dashboard reporting software allows for performance-improvement solutions, evidence-based marketing insights, and customer experience management consulting. Annually, Empathica’s 30 million customer surveys in 25 languages reach more than 70,000 locations in over 50 countries. A privately-held organisation, Empathica is headquartered in Toronto, Canada, has a European office in Birmingham, England and executive consultant offices throughout the United States. For more information about deriving actionable insights that enhance a brand’s operational excellence, visit Empathica at http://www.empathica.com. Named the highest new entry in the annual 2009/10 Superbrands survey, Krispy Kreme UK currently operates 50 stores and has a presence in over 300 cabinets with retail partners including Tesco outlets across the country. It entered the UK market in October 2003 in London and has since opened Hotlight stores in key cities including Manchester, Leeds, Portsmouth, Newcastle, Birmingham and Bristol. Krispy Kreme has a number of kiosks within London stations including, Waterloo, Victoria, Paddington and Euston, targeting commuters travelling to work. These kiosks have fresh doughnuts delivered daily. To check out your nearest store, go to http://www.krispykreme.co.uk. Traditionally, Krispy Kremes are sold in dozens – a unique taste treat to be shared and enjoyed with friends and family. 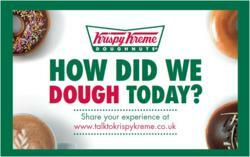 The full Krispy Kreme range will be made fresh daily at the Metrocentre Hotlight store.